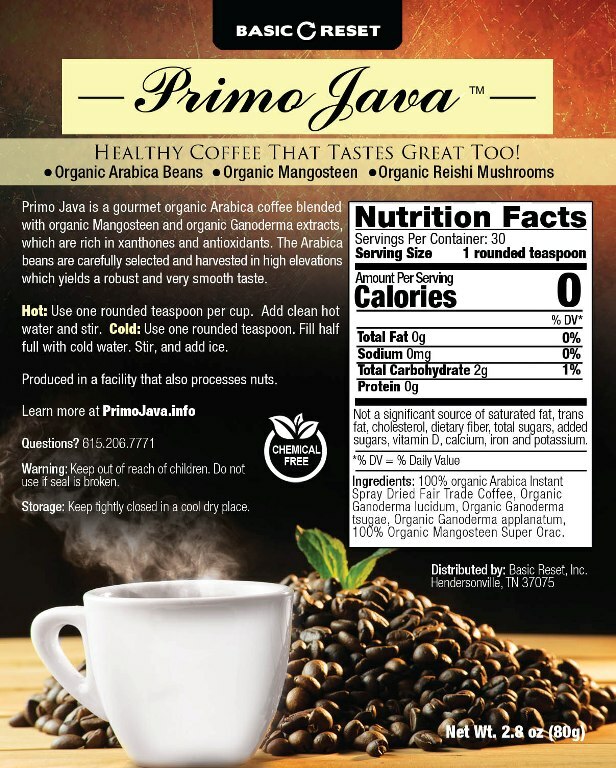 Primo Java offers the "best of the best" organic Arabica beans with the dietary health benefits of the amazing Mangosteen fruit and Reishi Mushrooms (Ganoderma). The Arabica beans are grown at high elevations producing some of the richest, smoothest tasting coffee in the world, with no bitter after-taste. Primo Java is an instant organic coffee, so you can conveniently enjoy a fresh cup anytime, hot or cold. Simply put: the dietary health benefits found in every cup of Primo Java are simply amazing! Why did we add organic Mangosteen Extracts? Mangosteen has been traditionally used in Asian cultures for centuries. The benefits of mangosteen have been realized since the 18th century and have further been proven through many independent scientific studies and clinical experiences throughout the past 30 years. Mangosteen is a storehouse of essential nutrients. The mangosteen fruit contains antioxidants, xanthones, vitamin-B complex, and fiber. This versatile, "super-fruit" extract, further enhances the organic Arabica beans that make up Primo Java. Why did we add organic Reishi Mushroom Extracts? 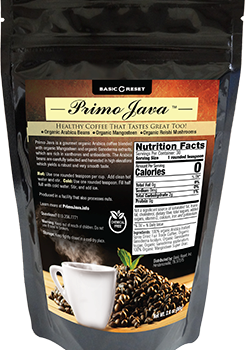 Primo Java qualifies as an organic healthy coffee with the addition of the organic Mangosteen extract alone. With the addition of the organic Reishi mushroom extracts, it's over the top! Other coffees on the market contain only one kind of Reishi, often referred to as Ganoderma. Primo Java didn't stop with just one type of Reishi mushroom extract, it has four different types: red, black, purple, and white. While other companies may have organic coffee and some even with Ganoderma, we couldn’t find any with both organic coffee and organic Ganoderma. Every ingredient in Primo Java is organic! Reishi mushrooms are helpful in supporting various body systems. Reishi mushrooms contain antioxidants and beta glucans. Antioxidants contain substances that inhibit oxidation or reactions promoted by free radicals. Beta glucans help support a healthy immune system. Directions: Approximately 30 servings per pouch. Hot: Use one rounded teaspoon per cup. Add clean hot water and stir. Cold: Place one teaspoon in a glass. Fill half full with cold water. Stir and add ice. Consult a health professional if pregnant or taking medication. Produced in a facility that also processes nuts. These statements have not been evaluated by the FDA. This product is not intended to diagnose, treat, cure, or prevent any disease. Consult your physician before use.